Its location on Lake Champlain, which borders New York, Quebec, and Vermont, helped Burlington develop into the second largest lumber port in the United States. Juniper Island is located close to the Burlington shore and was an ideal site for a navigational beacon as traffic increased in the area. Aside from crude early lanterns, Juniper Island Light was the first lighthouse built on Lake Champlain. The original 30-foot brick tower, built in 1826, was replaced by a 30-foot cast-iron tower in 1846. The tower, constructed of four separate iron cylinders, is the oldest standing cast-iron lighthouse in the United States. It is similar to the second Long Island Head Light (1844) in Boston Harbor and the present Monomoy Point Light (1849). The light was originally produced by 10 lamps and reflectors, but Juniper Island Light was later equipped with a fourth-order Fresnel lens exhibiting a fixed white light. A new stone dwelling was built in 1863. The station also had an automatic fog bell that sounded every 15 seconds. A new fog bell tower was built in 1874 for $1,000. For some time Juniper Island also served as a depot for the Lighthouse Service on Lake Champlain. Coal, buoys, oil and other supplies were stored on the island. Storms were not uncommon on Lake Champlain. A gale in July of 1890 destroyed boats and took several lives. In 1918, strong winds carried away 30 feet of the station's dock. A new concrete dock was erected in 1922. In 1954, the light was replaced by an automatic light on a steel skeleton tower. The island was sold at auction to Fred Fayette, a lawyer and state senator, in 1956. A fire started by careless campers destroyed the keeper's house in 1962. Fayette's 11 children inherited the island after his death. 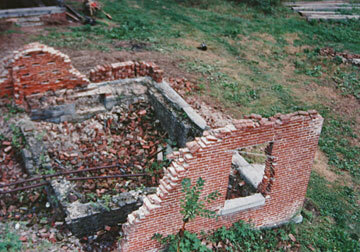 In the fall of 2001, work began on the reconstruction of the keeper's house. The bricks salvaged from the ruins of the old house were used to build the new one. Much of the work was done by volunteer labor, chiefly the Fayette family and their friends. Professionals were utilized for some aspects of the job, and the Coast Guard helped with the transportation of materials. The Fayettes have also painted the tower in recent years. There has been discussion of the possiblity of returning the navigational light to the lighthouse, but that seems to be out of the question because too many trees would have to be cut down. 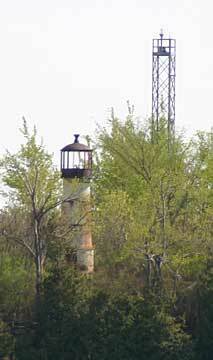 Because of the trees that surround the property, the lighthouse is difficult to see from the water. Left: The reconstructed keeper's house.